Just so you know, Aamer Rahman apologized for Islam last Friday night. Also—in advance—for daring to tell jokes about terrorism. You can’t be too careful these days. In his show at the Calvin College CFAC, the Australian comedian, who is of Bangladeshi Muslim descent, gingerly felt his way around and through American Evangelical sacred cows—religion, race, and politics. But the Calvin audience came mostly ready to laugh, and they were well warmed up by Michael Ribbons and by the Calvin Improv group. We can laugh about Islam here, and race too. What a relief to hear an Australian say that racial problems Down Under are worse than ours! But the room got very quiet when he referred to Israel’s genocide of Palestinian Arabs. And ISIS? He did not even touch that one. All Muslims these days are burdened by apologizing for terrorism. With every new terrorist incident in the news, Rahman and his high school buddies prayed fervently that the perps would turn out to be White Guys. When sketches of the Boston Marathon bombers (2013) showed White Guys, he heaved a huge sigh of relief—until he learned that the bombers were the wrong kind of White Guys. They were Chechen Muslims! Based on sheer numbers and percentages, it would seem to be a far greater danger that Judaism become a wholly-owned subsidiary of Settler Zionism, or that American Evangelical Christianity become an opening prayer for Answers in Genesis, than that Islam be hijacked by the latest al-Qaeda wannabes. After a near century-long history of European Jewish conquests and settlements in Palestine, armored IDF bulldozers still plow Palestinian houses in East Jerusalem and even ran over Rachel Corrie (2003)—and she was an American! Yet there they were, Australian Muslims standing in front of microphones and apologizing for HAMAS and Islam and violence. Well… do you laugh or cry? Aamer Rahman chooses to laugh. Humor is the best way to get people talking about issues. The Friday night crowd was way bigger than either the Gaza vigil two weeks earlier or the Gaza documentary the night before, even though that one featured the film director himself. 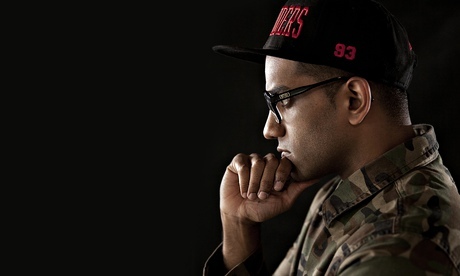 Aamer Rahman joked about his family’s disappointment that the big bucks they paid for his elite private education set him up to be a “traveling clown.” He joked about South Asians who can’t seem to go on a trip without “a bag of sandwiches, 15 suitcases, and a mattress.” He joked about the Prime Minister “completing Australia’s mission in Afghanistan,” when an American army “bad apple” had just left his base to kill sixteen Afghan civilians including women and children, and covered up the bodies with blankets. Islam—it has terrorists. America? America has bad apples. But the Calvin audience, who had probably never heard of the incident (2012), could at least hear of it now, through the laughter. Aamer Rahman was creative, fresh, and edgier than a West Michigan audience usually hears. As it often does, SAO sponsored a discussion with the artist after the event. My date wanted to go have a glass of wine, so we did not stay. Those who did told me that the local South Asian community expressed enthusiastic gratitude to student activities director Ken Heffner and the Student Activities Office for bringing Aamer Rahman to Calvin. That took courage, and the SAO has plenty of it. This entry was posted in Doug Howard and tagged Aamer Rahman, comedy, Evangelical Christianity, history, humor, Islam. Bookmark the permalink. 1 Response to Laugh or Cry? Wow! That sounds like a great evening, and an event I’m sorry I had to miss. What a great opportunity for dialogue from a much-needed and much-maligned source. Kudos, as you said, to Ken and the SAO.